Sea-Bird MicroCAT 02081 5 m Comparisons performed against CTD data recorded at the recovery of the mooring found the temperature and conductivity data to be of good quality, however because no CTD casts were available to perform comparison checks at deployment, the Originator recommends that these data are used with caution. Sea-Bird MicroCAT 02010 10 m Same as MicroCAT 02081. Sea-Bird 16+ SEACAT fitted with Seapoint Turbidity Meter #10490 04736 Located on seabed The Originator was unable to determine whether there were any offsets in these data as no CTD cast was performed close to the mooring when it was deployed. The Originator recommends that these data are used with caution. Temperature values have been adjusted by +0.02°C after comparing these data with the Sea-Bird MicroCATs present at this site. Teledyne RDI 600 kHz ADCP 5806 Located on seabed To correct for the magnetic declination (difference between magnetic north and true north) latitude values were changed by -3.8364°. All latitude values were modified by +5.799° to correct for the compass error. Sea-Bird 16+ SEACAT fitted with Seapoint Turbidity Meter #10487 04596 Located on seabed Comparisons performed against CTD found that the temperature data recorded by this instrument was of good quality. There were large offsets in conductivity and thus salinity at recovery. The smallest of the conductivity offsets observed at mooring recovery had a value of -0.0336 S m-1. No adjustments were made to either the conductivity or salinity channels, as deployment CTD checks found a decent match between the CTD data and data from this instrument. The Originator recommends that the conductivity data recorded by this instrument are used with caution. Teledyne RDI 600 kHz ADCP 3644 Located on seabed To correct for the magnetic declination (difference between magnetic north and true north) latitude values were changed by -3.9498°. All latitude values were modified by -1.9743° to correct for the compass error. 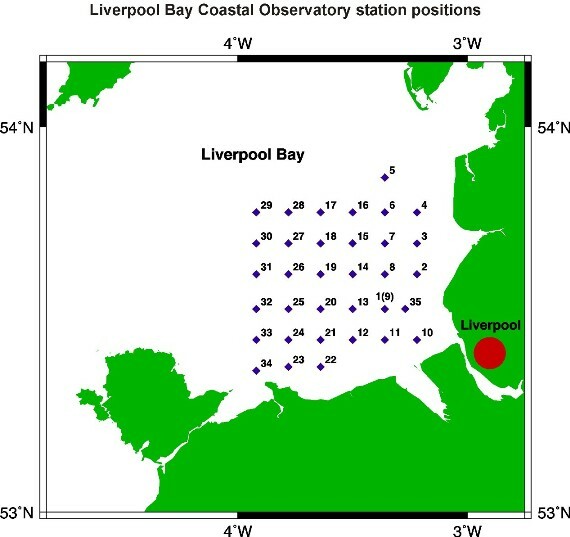 The data arrived at BODC as 117 ASCII format .dat files representing moored ADCP data recorded at the Coastal Observatory sites 1(9), 20 and 21 between 07 August 2002 and 20 September 2011. Following standard BODC procedure the files were reformatted into BODC standard internal format using an internal transfer function. This included removing surface null bins. 3beam_matrix None - - - Boolean value stating whether the data originator had performed the three beam correction on a particular bin. Values indicating that the three beam correction had been performed were converted into an originator's flag ('L') when the data were transferred into qxf format. This rig was deployed as part of the Proudman Oceanographic Laboratory (POL) Liverpool Bay Coastal Observatory during R.V. Prince Madog cruise PD16_06. Recovery of the rig took place during R.V. Prince Madog cruise PD20_06. Further details are given in the table below. Date and time are in Universal Time (UT) and are displayed in the ISO format YYYY-MM-DD hh:mm. This rig was a bottom frame with a Waves Acoustic Doppler Current Profiler (ADCP) mounted 0.5 m above the sea bed. The frame was fitted with two Benthos releases with fizz links and a spooler with 200 m of rope for recovery of the ballast weight. Sea surface height Mode 1: 100 pings every 10 minutes (velocity standard deviation 0.007 m s-1). 35 x 1 m bins (2.65 - 36.65 m above the bed). Beam co-ordinates - speeds, correlation, echo intensity, % good. Sound velocity calculated from temperature, depth and salinity of 32. Fitted with a pressure sensor; hourly wave recording enabled. Turbidity Sample interval 600 s. Fitted to base of frame with pumped conductivity sensor underneath. SeaPoint turbidity sensor s/n: 10471 taped to roll bar.